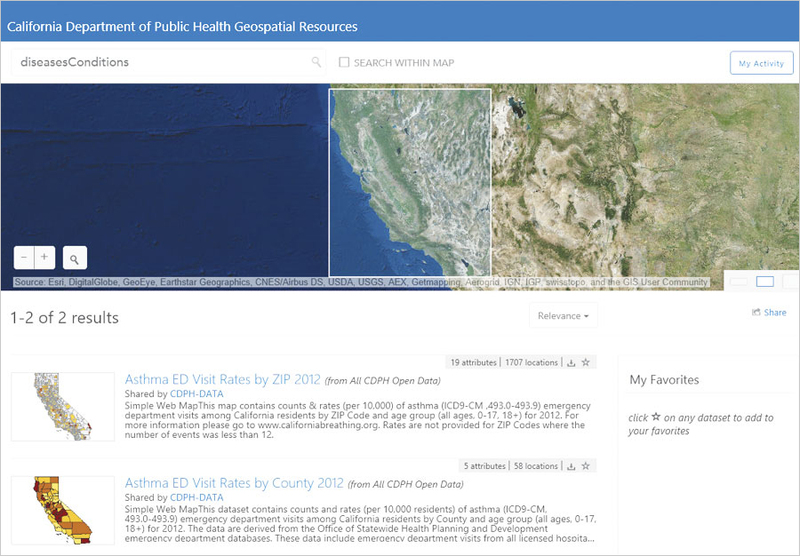 Charged with optimizing citizens' health and well-being, the California Department of Public Health (CDPH) uses ArcGIS Open Data to integrate its open data and share it with other experts and the community. CDPH's open datasets contain meaningful location information, which the organization can put into ArcGIS Online to develop further. In addition to enabling CDPH GIS professionals to use the data, having the datasets in an open data portal allows geospatial experts and developers worldwide to make good use of it as well. The department uses its open data to create maps, apps, and websites that better share information with the public. The My Hospital's Infections web map, for example, shows the rates at which California hospitals have cases of common infections, such as Methicillin-resistant Staphylococcus Aureus (MRSA) and Clostridium difficile infections (CDI). The department also created the Fire Response GIS 2015 site to share the public health effects of the 2015 California fire season. 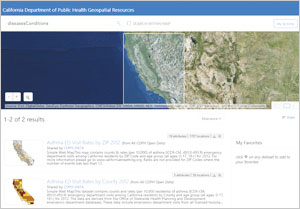 Currently, CDPH is expanding its ArcGIS Open Data site to incorporate the collection of open data managed by the California Health and Human Services Agency (CHHS). This includes data from all agency departments, such as the Department of Health Care Services, the Emergency Medical Services Authority, the Office of Statewide Health Planning and Development, and the Department of Social Services. When complete, the CDPH ArcGIS Open Data portal will establish a direct link with CHHS's own open data site.